SM Entertainment’s preliminary injunction against JYJ (Kim Jaejoong, Kim Junsu and Park Yoochun) to prohibit the sales of their first global album, The Beginning, has been withdrawn. SM Entertainment filed the injunction on October 12th believing that JYJ had signed an exclusive contract with CJeS Entertainment which would cause a dual contract situation. However, CJeS is the agency that JYJ hired to handle their management work just like Prain has been hired to handle JYJ’s PR. Korean Federation of Pop Culture and Art Industry (KFPCAI) (here after Munsan) on last October 13th sent out official letters of request to three public broadcasting stations MBC, SBS KBS, as well as cable broadcasting station, and other various online album distribution sites to refrain JYJ from making appearances on shows and halt album sales. This letter of request seems to be in conform with SM Entertainment’s action on the 8th, that was filing a provisional injunction application to Seoul Central Distric Court against JYJ exclusive contract and to ban the sales of their first world wide album ‘The Beginning’, after this news became widely known, it’s been caused a considerable stir into the already high-tense situation. Mass media reported the issue as “For JYJ who just make a comeback, this is definitely going to be an undesirable ‘reef’ to threaten their future activities”. However, despite the explanation of Munsan’s chairman, the request document whose content was exposed later to public had a formal document format thus put everyone in frowned. 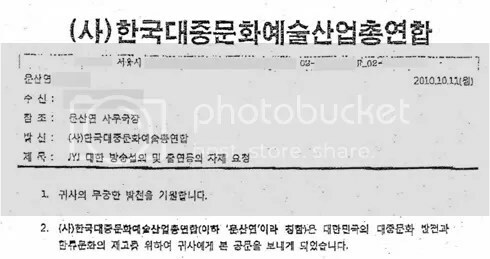 The document has title ‘Request to Refrain From Broadcasting JYJ Appearances’ with date printed was October 11th, and the content revealed , “Korean Federation of Pop Culture and Art Industry (as Munsan was referred) sent you this official memorandum in order to protect the cultural development and hallyu wave of South Korea.” as written at the body letter. Document’s ID number was not fail to be included as well. Regarding the memorandum, fans–based on information reported to the Fair Trade Commission–submitted petition to the court to embark on subsequent action plan. 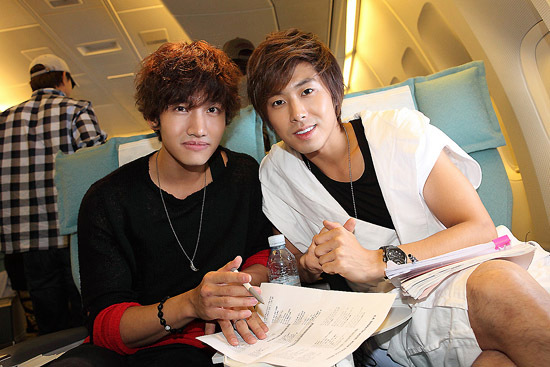 TVXQ agency released an official statement regarding TVXQ Yunho and Changmin preparing for a duet comeback. SM Entertainment has been in conflicts with Xiah Junsu, Micky Yoochun, and Youngwoong Jaejoong who teamed up under name JYJ and recently released a worldwide album, therefore a lot of eyes have been piercing towards the other two members’ future activities in return. Furthermore, the fact that the two members had performed their new songs in SM TOWN Concert has caused great expectations towards the preparation of their duet album. SM Entertainment continues to disrupt the debut of the three breakaway members of TVXQ, one of Korea’s most popular boy bands. JYJ is comprised of Jae-joong, Yu-chun and Jun-su. On Oct. 8, SM Entertainment filed an injunction with a Seoul court to stop the release of “The Beginning,” and filed a suspension on exclusive contract with C-JES Entertainment. C-JES Entertainment is a Korean agency that is now managing JYJ. SM Entertainment recently complained, saying that signing a contract with C-JES Entertainment amounts to holding an unfair double contract. SM Entertainment also continues its attempt to stop JYJ’s debut in other countries. Sports Korea recently reported that SM Entertainment has sent files of complaint to the head quarter in United States of JYJ’s distributor, Warner Music Korea. “The Beginning” is recorded entirely in English and is supposedly to be released in several countries worldwide. The Korean Federation of Pop Culture and Art Industry has sent letters to TV stations KBS, SBS and MBC and cable network Mnet, and Korean online music sites and asked them not to allow JYJ to appear on their shows and sell the digital albums. However, Korean online music sites defied the letter and released the digital copies of JYJ’s “The Beginning” album on Oct 14. The songs in the album entered the top 10 on real-time music charts. This coincidence is a greater source of despair for JYJ members, as they had to cancel 500 albums reserved before their showcase on Oct. 12. Since their showcase, Korea Sports has reported that there were absolutely no signs of JYJ’s on any television channels. JYJ previously planned to have showcases in other countries to meet their worldwide fans for their debut. However, an ongoing dispute with SM Entertainment over legal issues related to their contract; it might take a while before the trio can perform without restraints. JYJ’s side has retaliated against SM’s exclusive contract suspension and album sales prohibition injunction that was filed to the Seoul District Courts on the 8th against JYJ’s worldwide album ‘The Beginning’. SM accused the members of JYJ, Kim Jaejoong, Park Yoochun and Kim Junsu, of signing onto an exclusive contract with CJeS Entertainment even though their exclusive contract with SM as not ended yet. Following this, the Korean Federation of Pop Culture and Arts Industry released an official notice to all broadcasting companies, label companies and online music distribution companies asking them to refrain from aiding JYJ in any way for the same reasons. JYJ had a partial victory from their exclusive contract suspension injunction against SM Entertainment, but as their contract with the entertainment agency has not been ended yet, they would be in an illegal dual contract if they have signed an exclusive contract with CJeS Entertainment. Definition of Agency: Fiduciary relationship (Special relationship of trust and confidence in which law demands a higher than ordinary degree of care and responsibility from the dominant or trusted party) between two parties in which one (the ‘agent’) is under the control of (is obligated to) the other (the ‘principal’) . The agent is authorized by the principal to perform certain acts, for and on behalf of the principal. The principal is bound by the acts of the agent, performed in carrying out entrusted duties and within the scope of agent’s authority. An agency can be created by (1) express agreement, whether oral or written, (2) implication, based on the custom or practice of the trade, or (3) conduct of the principal. Creation of agency is essential to commercial and financial transactions, because an organization (as a legal entity) can function only through its agents. T/N: In Korean, the distinction is made as 에이전시 (agency, CJeS) and 소속사 (affiliated company, SM). The concept of an ‘agency’ is still quite rare in the Korean entertainment industry as most celebrities work under an entertainment agency/company such as SM, YG, JYP etc, that is in charge of everything, instead of hiring an agency to work for them for a particular field. JYJ have different agencies working for them for different areas. Which side will the Seoul District Courts favor? Sports Korea has verified the reason, content and future of SM’s injunction. It was on the 8th that SM filed an album sales prohibition injunction against JYJ’s first album. At the current moment, it cannot be known whether or not the Seoul District Courts will accept the injunction and consider it valid. The issue at hand between SM and JYJ seems to be the scope of the independent activities JYJ won in their legal dispute with their agency. It can be predicted that both sides will engage in a fierce legal battle regarding this matter. At the hearing on the 11th, Warner Music Korea, the distribution company in charge of JYJ’s first album , stated, “We see the selling of this album as an act that is allowed according to the previous verdict made on the injunction filed by JYJ against SM that gave JYJ the freedom to pursue independent activities.” It was told that the Courts seemed to agree with this statement. It is difficult to predict the Courts’ verdict at this current moment. However, it looks like the Courts’ views formed from the hearing may determine the future of the injunction. JYJ’s album was released in the market on the 14th. If the Courts’ accept SM Entertainment’s injunction as valid, all of the albums in the market will be recalled. Both sides will be submitting additional documents till the 18th. The verdict is expected to be made later this month. SM has begun their omnidirectional pressure on JYJ. SM Entertainment filed an exclusive contract suspension and album sales prohibition injunction to the Seoul District Courts on the 8th. Though JYJ was granted independent activities in their injunction filed against SM Entertainment last year, SM believes that the contract they have signed with CJeS is an unlawful dual contract as the Courts have not suspended the exclusive contract between SM and JYJ. SM’s pressure is even occurring overseas. It has been confirmed that SM has sent a certification of contents to the US headquarters of Warner Music Korea, the company in charge of distributing JYJ’s album. It can be seen that SM did this due to the fact that this album was one that was released simultaneously in various parts of the world. However, the distributor of this album is Warner Music Korea. Warner Music Korea is offended that SM has sent the certification of contents, which calls for the recipient to take responsibility for the matter, to the US headquarters and not to themselves. The Korean Federation of Pop Culture and Arts Industry has sided with SM. The KFPCAI has sent an official notice asking broadcasting companies and online music distribution companies to refrain from allowing JYJ to appear on their shows and from distributing their music. Their reason was that JYJ was causing a negative affect on the ‘Hallyu Wave’. However, many representatives of the industry believe they are doing this because JYJ has become a ‘thorn’ in SM’s side as they have created conflict with the entertainment agency. JYJ could not be seen on TV after 12th and their ranks on online music sites have stayed in the 10s since their music was released on the 14th. JYJ is suffering from problems from their own country. These events were more shocking as they happened right after their showcase on the 12th. The wound was bigger as they suffered from 500 ticket orders for their showcase suddenly and simultaneously being canceled right before the show. The reason JYJ decided to fight SM in a legal battle was to participate in free music-related activities. However, with it becoming harder and harder to perform, the foundation of the group is beginning to shake. With domestic stages shut off from them, JYJ are planning to greet their fans through overseas showcase events.